Founded in 1949 under the UNESCO sponsorship, the International Political Science Association (IPSA) promotes the advancement of political science through information exchange and open collaboration among scholars throughout the world. Its recently redesigned website (available in English and French) provides plenty of interesting features. While full online membership services, such as access to online version of the International Political Science Review and members directory, are restricted to IPSA members through their personalized profile, the website still offers a wide variety of free services. The main page constantly provides updated news, calls for papers, events, job postings and other relevant information related to IPSA and political science worldwide, all of the above under a simple and effective interface, also available in RSS news feeds subscription. 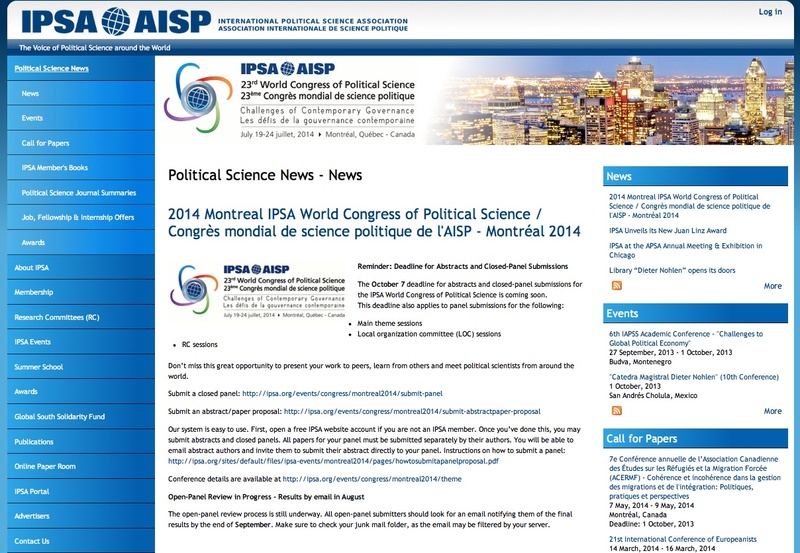 The website also offers information regarding all major IPSA activities such as World Congresses of Political Science, IPSA summer schools, Research Committees, direct links to all national political science associations and institutions affiliated with IPSA, IPSA awards and various IPSA publications. It also includes a direct link to Ipsaportal (an on-going project covering 300 of the most relevant websites in political science), free access to Participation magazine, as well as free registration to the IPSA’s monthly E-Newsletter. The Online Paper Room also provides free access to papers that were presented at World Congresses and other IPSA related events since 2006. IPSA is also greatly active through social medias, such as Facebook and Twitter. I noticed that in your list of associations you included the Quebec Political Science Association but not the Canadian Political Science Association. It seems to me that, as an international association, you ought to have included the CPSA, not the QPSA, especially since, if I recall correctly, the CPSA was one of the first members of the IPSA.